Name: Enter a name for the new Load Agent. Server: Enter server name or IP address. Port: WAPT Pro Workplace will use the specified port to connect to this agent. Type: Here you can see the type of agent (Load Agent, x64 Load Engine or Cloud Engine). Version: Here you can see the version of Load Agent. When you add a new agent, these fields are empty. The type and version number appear when you select some agent in the list of Load Agents and click the Edit button to view agent settings. Use IP spoofing: You can set up multiple IP addresses on any server running Load Agent and then use several IP addresses during tests to emulate page requests coming from multiple computers. This feature is called IP spoofing. Check the Use IP spoofing option to enable it for current agent. Click the IP Address List... button and you will see the list of IP addresses available on the server running Load Agent. Select desired IP addresses and Load Agent will use them during test runs to emulate page requests coming from multiple computers. If you select several addresses, they will be used one after another repeating as a cycle through all users of all profiles. Select All: Checks all IP addresses in the list. Select None: Removes all checkmarks in the list. 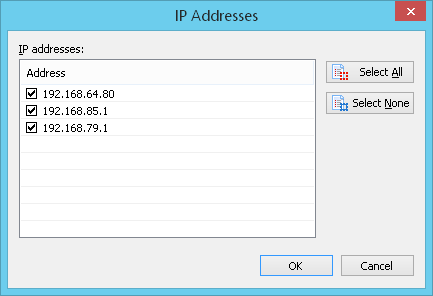 Note that you should set up several IP addresses on servers running Load Agents beforehand and then you will see them in the dialog above. If you turn on IP spoofing and use several IP addresses on a computer running Load Agent, then user's log will contain information - which IP was used for execution of the current user session. You can see this information in the Logs view. Use proxy server while performing the test: If you check this option, Load Agent will use the proxy server during test runs. By default, Load Agents connect to the tested server using the direct connection (without using the proxy server). 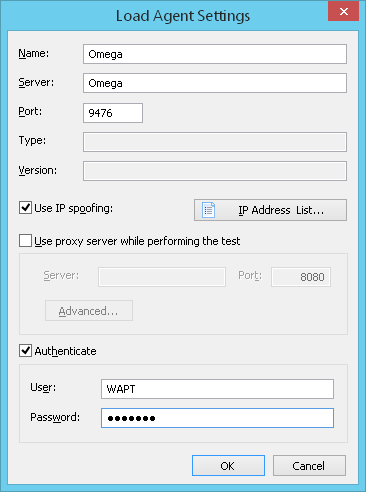 However, you can check this option to use the proxy server during tests, and specify the certain proxy configuration. Server: Enter proxy server name. Port: Enter proxy server port number. Use authentication: Check this option if the proxy server requires authentication. Enter username and password for proxy authentication. Load Agent will automatically define the type of authentication (basic authentication or Integrated Windows Authentication (NTLM)). 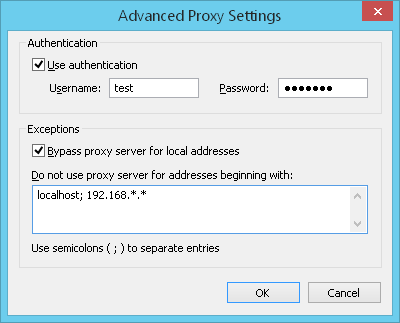 Bypass proxy server for local addresses: Check this option to bypass the proxy server for local addresses during test runs. Do not use proxy server for addresses beginning with: Load Agent will bypass the proxy server during test runs for addresses that you specify here. If you enter several addresses, separate them by semicolons. Note that testing through the proxy server could lead to distortion of test results. We recommend using proxy only in case it is really necessary, for example, if the tested server is outside the firewall and there is no direct channel to it, or if you wish to test the proxy server. If you install the Load Agent on a remote server where you run your tests, you may need to prevent unauthorized access to it. For this purpose WAPT Pro provides you with the opportunity to make authorization on the agent. If variable AllowEveryone="TRUE", then everybody will be able to access the agent. Note that if you set variable AllowEveryone="FALSE" but do not specify the list of usernames/passwords, then nobody will be able to connect to the agent. If the agent requires authorized access, you should specify the username and password for authorization in agent settings in WAPT Pro Workplace. Then each time you connect to that agent, it will automatically check credentials specified in its settings. If the Load Agent accepts credentials, you can use it to run your tests. Authenticate: Turn this option on if the Load Agent requires authorized access, and specify the username and password for authorization.